Srinagar: The Jammu and Kashmir Board of Secondary Education (JKBOSE) opened the re-evaluation process for the class 12 exams. The board had declared the class 12 exams results for Jammu region on January 3. The candidates who had appeared in the class 12 examination can now apply for re-evaluation on the official website at jkbose.ac.in. 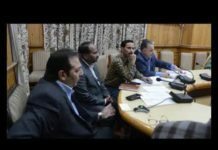 However, the re-evaluation process is only for the students of class 12 of Jammu region winter zone. In the Class 12 results, Aqsa Farooq of Green Model School in Doda has topped the JKBOSE class 12th 2018 examinations by scoring 95 per cent from Jammu Division. Girls outclassed boys once again, grabbing the top three positions in the science stream. The board has recently released the class 12 exams results for the Kashmir region on its official website.